U.S. Sens. 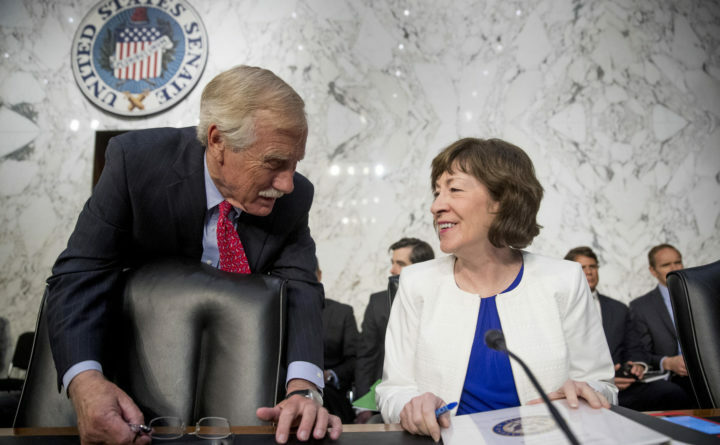 Susan Collins and Angus King. Maine’s U.S. senators are again split on a key nominee from President Donald Trump. The Republican-controlled Senate, including U.S. Sen. Susan Collins, R-Maine, voted Tuesday to move ahead with limited debate on Trump’s nominee for attorney general, William Barr, likely paving the way for a final confirmation vote in his favor on Thursday. While every Trump nominee is a rallying point for liberals these days, Barr is a relatively minor one. For them, the main issue is how Barr will steward Special Counsel Robert Mueller’s investigation into Russian interference in the 2016 election. At his confirmation hearing, Barr said Mueller “will be allowed to complete his work” on his watch, though he has publicly criticized the investigation and authored a memo arguing that Trump didn’t obstruct justice when he fired James Comey as FBI director in 2017. Collins has long supported the Mueller investigation and expressed concern about the appointment of Matthew Whitaker as acting attorney general to replace Jeff Sessions, whom the president fired last year. On Tuesday, her office said she will vote to confirm Barr. The Republican believes it’s “critically important to have an experienced, Senate-confirmed Attorney General to oversee the Mueller investigation and bring stability to the Department of Justice,” her spokeswoman, Annie Clark, said Tuesday evening. He chided the memo and criticized Barr’s public indecision and, at times, refusal, over whether to make the findings of the investigation public, once it’s complete. King and Collins have increasingly gone in different directions on Trump nominees since the beginning of the president’s tenure. Collins has generally voted for Trump’s nominees. King backed six of Trump’s original nominees, notably former Secretary of State Rex Tillerson, early during the president’s tenure, but he has increasingly become a “no” vote. The two Maine senators opposed the nominations of Education Secretary Betsy DeVos and Scott Pruitt, the former Environmental Protection Agency administration. They split on Sessions and on Trump’s two Supreme Court nominees, Neil Gorsuch and Brett Kavanaugh, with Collins casting a key vote for the latter’s confirmation. Collins and King largely present a collegial approach to their work as Maine’s senators. The Trump factor bears watching heading into 2020, when Collins will likely face a well-funded re-election challenge amid close attention to whether she will further embrace Trump, whom she didn’t endorse in 2016. Snow is falling outside the dome. State offices are closed until 11 a.m., except in Aroostook County, where they’re closed all day. Legislative hearings are canceled. Public hearings and work sessions on referred legislation will be rolled into future committee meetings. The House and Senate are due to return on Thursday. — A plan to provide financial relief for federal workers in Maine during shutdowns is on its way to floor votes. The Health Coverage, Insurance and Financial Services Committee on Tuesday voted 11-2 to recommend a bill sponsored by Senate President Troy Jackson, D-Allagash, that would have the Finance Authority of Maine guarantee bank or credit union loans to unpaid or furloughed federal workers. Rep. Josh Morris, R-Turner, and Rep. Gregg Swallow, R-Houlton, were the only committee members to oppose the bill. Swallow said he objected because it sets a “precedent for the state to get involved in unsecured personal loans.” The bill, LD 477, now moves to the Senate and House for floor votes. It requires two-thirds majorities in both chambers to pass as an emergency measure. Gov. Janet Mills has expressed support for it. Meanwhile, lawmakers in Washington, D.C., say they have a framework for a deal to prevent another shutdown from starting Friday. Trump, who would have to sign the deal, said Tuesday it made him “unhappy,” but CNN reported this morning that he plans to sign it. — The governor said Tuesday that if utility companies throw in enough sweeteners, she could support a controversial transmission line through western Maine. Maine Public reports that Mills, who during her campaign expressed skepticism about the $1 billion proposal to build a transmission line to deliver electricity from Hydro-Quebec dams to Massachusetts customers, has now warmed to the proposal because developers are adding incentives for Maine. “I like the progress that they are making. And I like the subject areas they are addressing. Electric vehicles for instance, and electric vehicle charging stations all over Maine. I could see that happening, and I appreciate and welcome their help in that regard,” she told “Maine Calling.”. — Don’t plan on fishing for Maine Atlantic salmon any time this century. In a new analysis of the state of endangered species, federal officials estimate that it will take 75 years — about 15 generations of fish — for populations of Gulf of Maine Atlantic salmon to be healthy enough for fishing to resume. Additionally, the plan estimates that the annual cost of implementing recovery actions will be $24 million per year on top of recovery-based efforts covered by regular federal budgets. Today’s first big snowstorm of the Mills administration conjures memories of her more volatile predecessor’s early approach to winter weather. That did not go over well with state workers and unions, who noted that some branches of the discount store had closed earlier than state offices during a previous storm.